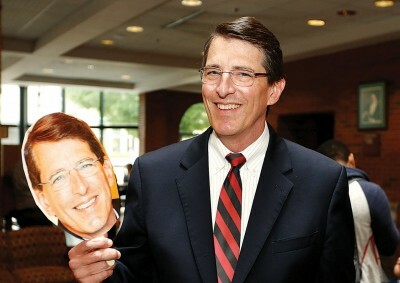 This summer marked 10 years since Rock Jones assumed the role of president of Ohio Wesleyan, making him the 10th president of OWU’s 16 to reach that milestone. Just a few days after a surprise celebration to mark his decade in office, Rock sat down with OWU Magazine editor Molly Vogel to look back, look forward, and discuss the 24/7 job of being president of OWU — even if it’s 10:30 p.m. in a grocery store. OWU Magazine: Let’s start with the surprise celebration. What’d you think? Rock Jones: There were so many things about it that I enjoyed, most importantly the energy of the students and the support of the faculty and staff who were present. I enjoyed the “16” T-shirts echoing the ones that were created 10 years ago when I began. That was really fun for me. OWU: You mention the energy of the students. Your schedule is so packed, how do you find the enthusiasm for each day? Rock: Well, the students certainly provide the energy. It’s also very important to do things necessary to maintain energy. I take time in the summer to replenish, then I’m careful to devote my time in the places that have the most long-term impact for the University and that also give me the energy and fuel that I need. So if there’s an athletic event and I’m in town, I’ll be there. If there’s a theatre performance and I’m in town, I’ll be there. If there’s a campus lecture and I’m in town, I’ll be there. The energy fades if I lose that contact with the students. OWU: Can you pick a favorite part of your job? Rock: The favorite parts of the job all involve people. I have the extraordinary pleasure and honor to interact with a lot of different people at a lot of different places in life. Obviously, the students are the focus. Watching them grow and evolve over four years and being at a setting where the president knows students well and can really interact with them is deeply rewarding. And it’s rewarding now a decade in to be at alumni events and to hear from young women and men I knew as students talk now about life after OWU and how OWU prepared them. Melissa and I also get to interact with alumni who are involved in leadership in every sector of our society, who have great passion for OWU, and who want nothing more than for their alma mater to thrive. Then there are the faculty and staff who devote their lives every day to our mission, who are the heart and soul of OWU and whose dedication inspires me every day. OWU: You just mentioned the incredible breadth of people you interact with, and anyone who has ever emailed you knows that you’re very responsive. How are you able to keep up with that? Rock: It takes time. Email can consume you. I have always wanted to be accessible, and I do make it a point to reply to every email I receive, but I have also learned that there are times when I have to put that on hold to ensure that the work that is going to have an impact for the next 25, 30 years is not put on the back burner. I do my best to not finish the day without being current on email. OWU: I think everyone knows the tyranny of the inbox. What’s something about your job that people would be surprised to learn? Rock: The president’s home here (Pritchard House), which is very comfortable and where we are happy and honored to live and where we host between 75 and 100 events each year — it’s amazing the number of people who think we don’t live there, who think that we just have official events there. Also, it’s a very public life. I can be at Kroger at 10:30 at night and someone will stop to want to ask a question about OWU, and that’s all right. OWU: Is there a part of your job that you have to psych yourself up for? Rock: In some ways, the biggest challenges can be the most interesting but they can also be the most consuming, so working through a particularly dense spreadsheet is not likely my favorite part of the job. It’s a lot more fun to be raising money with donors than to be balancing a budget internally, although both are important. OWU: How has your job changed in 10 years? 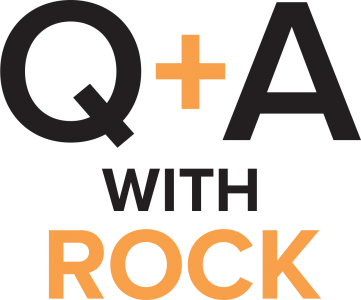 Rock: This is not so much about being president at Ohio Wesleyan as it is about being president of a good small liberal arts college. These are difficult times. There are headwinds in our sector that face all small colleges: Demographics are changing, preparation for college has changed, family resources have changed. There are fewer students with the preparation and the resources, even with the very generous financial aid we provide. There are more questions about the value of a liberal arts education than ever before. I think those questions are terribly misguided. We have to be much crisper in demonstrating the value of what we do and why it matters. To the extent the job has changed in 10 years, it has changed not in response to internal dynamics but to external ones. OWU: Are those challenges something you feel the broader OWU community understands? Rock: I think they do. There has been some remarkable work by the faculty: the creation of the new majors, the Bachelor of Science degree, the advancement of The OWU Connection, and the new sports, the marching band, the programs to provide additional academic support and improve retention. All of those are responses to these challenges, and I think Ohio Wesleyan’s faculty and administrative leadership have responded more briskly than many. OWU: What do you wish people knew about OWU? Rock: The students who come to Ohio Wesleyan, who work hard and do well, when they graduate they are competitive with the best students from any small college in the country, including those that are ranked the very highest. I don’t think the outside world understands that. At Ohio Wesleyan, the attention that students receive exceeds peer institutions. The OWU Connection is an extraordinary set of opportunities for students to connect what they learn in class and on campus to prepare them for life beyond OWU, and our surveys show that this is not as well-known as I think it should be. OWU: In that context, now entering your second decade in your role, are you starting to think about what you want your legacy to be? Rock: I think the legacy of any president at an institution of our sort at this time, given the challenges I was just describing, would be to leave the institution where it is healthy and vibrant and where its mission continues to be fulfilled with a foundation that protects it well into the future. We have a campaign to complete that supports that legacy. We have an enrollment problem to solve that is critical to that legacy; I think we’re moving on that. We have a residential life facility problem to solve in order to fulfill that legacy. Those are the big areas of focus for me over the next five years that I think contribute to that ultimate legacy of staying strong, vibrant, and vital as a residential, undergraduate liberal arts university and perpetuating the mission of an institution that educates moral leaders for a global society. OWU: Do you allow yourself to think about what you’ll do when you retire? Rock: Yes. It will involve some combination of books, travel, grandchildren, and continued involvement in higher education – just not anytime soon! Have you ever binged a TV show? Lark Rise to Candleford (BBC) and This Is Us (NBC). Anything NPR: Freakonomics, This American Life, How I Built This. Cooking. I read novels in the summer; I enjoy historical fiction. Gardening, when I have time for it. Mudbound by Hillary Jordan and The Blood of Emmett Till by Timothy Tyson. What is your favorite getaway destination? Do you have a favorite AVI meal? Not yet, I tend to eat salads. This is a job where you have to be careful what you eat.